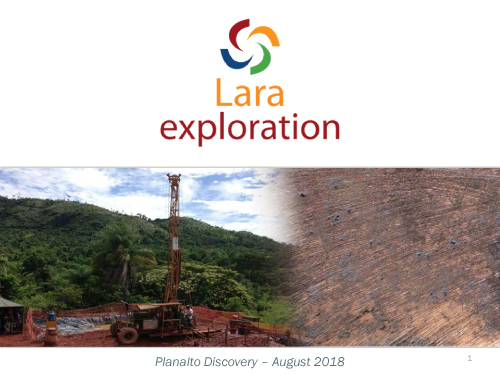 Planalto Copper Project | Lara Exploration Ltd. The Planalto Project comprises three exploration licenses, totalling 4,726 hectares in area, covering meta-volcano-sedimentary sequences and intrusives of early Proterozoic-age, located near Vale S.A.’s Sossego copper mine, in the Carajás Mineral Province of northern Brazil. Data provided by the vendors, includes reports of previous exploration work including soil sampling and two diamond drill holes (the Company does not have access to the drill cores or samples to confirm these historic results). Past exploration work includes surface sampling, which outlined two copper-in-soil anomalies with values in excess of 300 parts per million (“ppm”) copper, one approximately 1.3 kilometres (“km”) by 0.9 km in size, the other 2.9 km by 0.3 km. The historical reporting also includes results of two drill holes executed approximately 100 metres (“m”) apart on the same East-West section on one of the copper-in-soil anomalies. Hole FD-73 has a reported intercept value of 188 m of 0.4% copper, including 15 m at 0.67%, 14 m at 0.68% and 10m at 1.18% copper. Hole FD-74 has a reported intercept of 50 m at 0.38% copper, including 21 m at 0.6% copper. Lara may defer 50% of the annual cash payments in the event it is unable to secure third party finance or a partner. The vendor will also be entitled to a 2% NSR royalty on any production; Lara retains the right to purchase 50% of this royalty for a cash payment of US$2 million.